Tarps Plus Blog: What Do You Know Of Blue Poly Tarps? What Do You Know Of Blue Poly Tarps? It is possible to protect swimming pools with blue poly tarps. Tarpaulins or tarps seem like large sheets of materials. The poly tarps can be made out of canvas cloth or plastics such as polyethylene or polypropylene. Generally, a tarpaulin is long lasting and pliant. Swimming pool tarps are usually blue in color. Considering that the color of pool water is blue, a blue tarp seems appropriate. Tarps meant for pools are suitable for use during winter or summer. Depending on the size and design of your swimming pool, you can buy a custom-made tarpaulin or one to fit the regular shape and size of swimming pool. A blue tarp can withstand the cold and harsh winter days. Since it is resistant to mildew and is not prone to rot quickly, it is a good choice for the winter days. It can also be used during the hot summer days due to its UV resistant property. Other than using a blue tarpaulin as protection for your swimming pool, you can also use it as a cover. During winter and autumn days, it is normal for leaves and other debris to collect in the empty pool. By covering the pool with a tarpaulin, there is no necessity to clean your empty pool. When you wish to reopen the pool for summer, you can simply throw away the rubbish on the tarpaulin. Generally, there are three types of blue poly tarps based on weights, super heavy duty, heavy duty and medium duty. For longer protection, the heavy or super heavy-duty one would be the right choice. So, if you have a swimming pool, think about buying a blue tarp for the pool. It is possible to use one as a cover for the swimming pool during winter or autumn days. You do not have to clean the pool. Simply throw away the leaves and debris, which accumulated during autumn and winter days when you reopen the pool for summer. 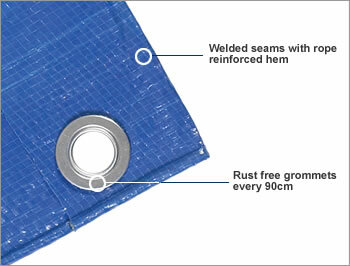 The tarp is also useful to protect your pool from any damage.